Creating family get-togethers can be a challenge even for the best planners. How do you find an activity that works for kids, adults, teenagers, and the grandparents? For that matter, how do you find a fun activity for just kids and parents? Rafting to the rescue! Rafting includes everyone—plus it’s more fun than PlayStation and cooler than an Xbox! The ideal family activity—rafting brings people closer together, creates lasting memories, and connects people across generations. You can set the trip up over the phone or online, whichever is easiest for you! We’ll guide you through the details—from what to bring, how to get here, and where to see your pictures. Our more than 45 years of experience makes planning a breeze which means your family has more time to laugh and enjoy time together! Raft on any South Fork or Middle Fork American trip departing on a Thursday or a Sunday and receive a 50% discount for each youth (17 years or younger) accompanied by one full paying adult. Raft any time on any river and receive a 10% discount for all youth. If your family rafting trip doesn’t include kids, check out our Group Discounts—they start at just 6 people, but the more you bring the more you save. 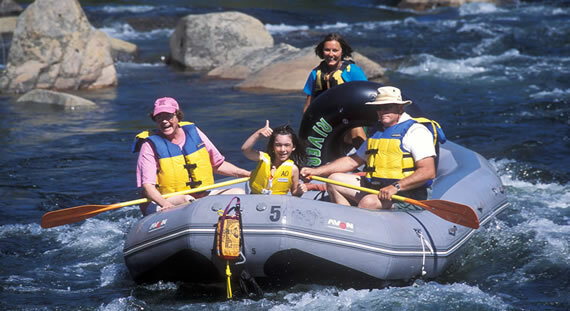 Family activities usually need to work for a wide range of ages and abilities, so we suggest you start by looking into an American River rafting trip. These rivers offer equal amounts of exciting whitewater and time to kick back with your family. To learn more about the Forks of the American River, go to our river video gallery! If you don't find what you're looking for there, you can check out the other seven California Rivers we run.